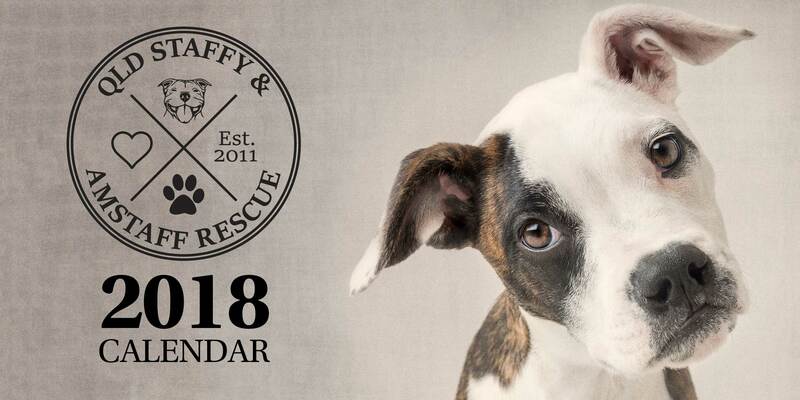 Zoo Studio was again proud to be a part of producing the QSAR (Qld Staffy and Amstaff Rescue) 2018 Calendar. Ken donated his time to photograph each star for the calendar, which was produced in-house. Most of these stars came from a sad beginning, but all have a happy tale (and tail!!) in the end …… with the best stories always being the “fosterfails”. What a badge of honour to call yourself a “fosterfail”! Covergirl, Teela, came to QSAR as an 8 week old surrender. The QSAR team of volunteer carers and foster families, who are an extremely dedicated and devoted group, rely on the support of their followers so this calendar is a gratifying way to assist with their much needed fund raising. 100% of the proceeds of this calendar goes to helping dogs in need ….. and this year’s calendar was a sell out, all 2000 of them! Better get in early for 2019.